Just watched the news - there are several wildfires burning out of control in the UP. No idea at this point how close any of them are to our properties. We didn't see anything on the drive up, but I guess that makes sense since the fires are in the North and we came up from the South. If the forecast holds, the winds moderate, and some cooler wet weather arrive tomorrow, these things should be under control. In the meantime, it looks like at least 15-20 homes have been destroyed. UPDATE: Wildfires break out in North Central U.P. Homes have been evacuated and structures have been lost. Wednesday, May 20, 2009 at 7:19 p.m.
"NICE Community Schools have been closed due to the Black River Falls Fire. The 6th grade field trip to Mackinac Island will depart on schedule. Visit our school closings page for the very latest. The fire has charred 750 acres at this point. DNR units have eight plow and nine water units on site. Numerous fire departments are also assisting in the blaze. This is a very agressive fire which started late afternoon Wednesday. 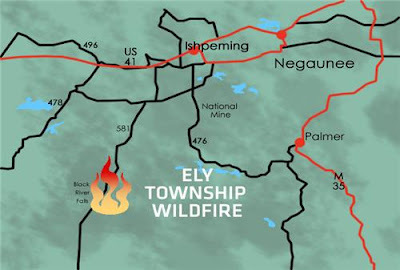 It burned through stands of jack pines and is west of County Road 581. At this time, the fire has not jumped the road. The fire is believed to have started around County Road CS and has since moved north to County Road CD. Officials are saying the fire has not reached the Twin Pines area. 500 people have been evacuated and structures have been lost. We're working to find more details at this time. This fire north of L'Anse has charred a couple hundred acres according to officials. At this time, it's approximately 20 percent contained. 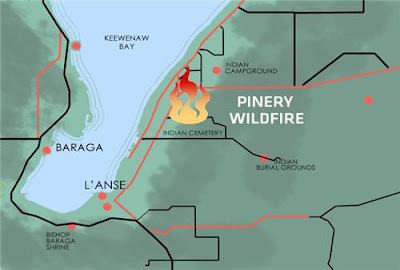 Two fire departments, L'Anse and Baraga, are battling the blaze while many others are on standby. It is currently burning through hardwoods and has taken down a pine plantation. Winds are currently out of the south-west and the fire is moving in a north-east direction. Officials believe a windshift is expected with the arrival of a cold front. Temps should drop and winds will shift from the west. Stay with TV6 and upnorthlive.com for the very latest"